I caught this rather nice looking Freightliner (Landstar Express American #3631) today, taking a break at Wal-Mart #2599 in San Antonio, TX. I'm guessing this one is part of a small fleet leased on to Landstar. Here's a shot of a similar truck from the expediter row at the Bordentown Petro on 5-6-09. Different unit numbers & a few other little items too. The two photos are of the same truck with the same truck number. Diane and I know the team who drives it; nice folks who provided us with great coaching and support when we were brand new to Landstar. Charlie is correct. This truck is leased to Landstar by a fleet owner based in Florida. Hey A team the truck numbers on the hood are different in those pictures. 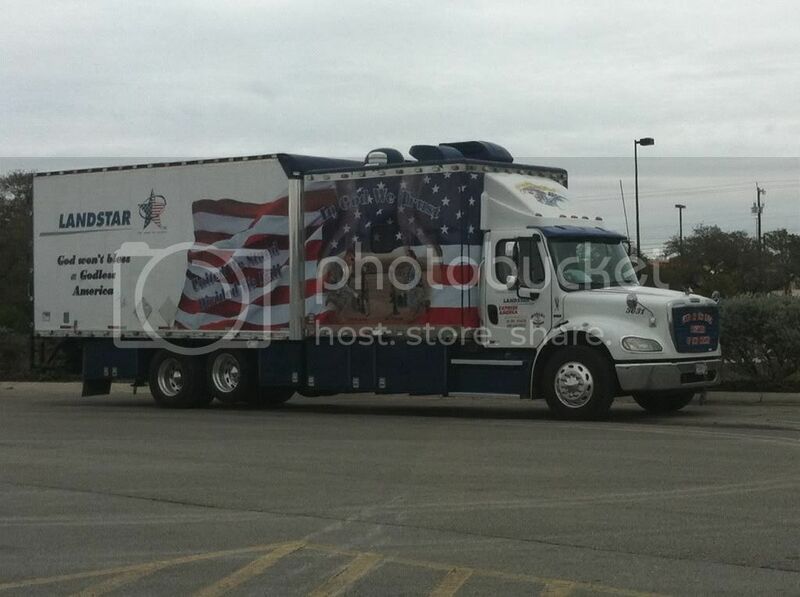 Is there another number Landstar goes by we don't see? The top pic # is 3*31 and the bottom number is 3919. It's neat to see the changes they did to the truck over the years though.